Coleraine boss Oran Kearney believes his struggling side can turn things around - despite seeing them fall to a seventh successive league defeat. 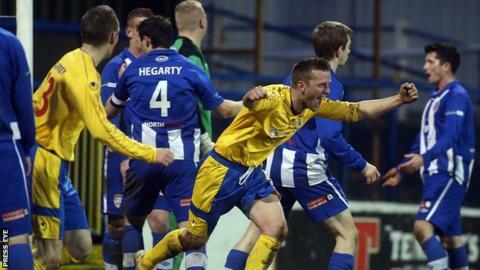 The Bannsiders lost 2-0 at home to Dungannon Swifts and their next game is the big Boxing Day derby against fierce rivals Ballymena United. "Losing can become a habit, just like winning. But I am sure we are not far away," said a resilient Kearney. "It is not easy to take and, of course, it is very disappointing." Coleraine, whose last league points came in a 3-2 win over Glenavon on 2 November, remain 10th in the table, two points ahead of one-from-bottom Warrenpoint Town. Kearney has not tasted defeat in the 11 derby clashes he has been in charge for, but that record could be under threat against a Ballymena team pushing for a top-six position. A lengthy injury list has not helped matters, but Kearney insisted he was not losing heart. "I am confident things will turn around. I would not be here if I didn't," he added. "I do not usually moan about injuries, but we have five or six big players, boys who would start week in week out, on the sidelines and that leaves us struggling. "If you look at our bench for the Dungannon game, it was full of kids basically. "It shows we are down to the bare bones. It is a squad game and we have to batten down the hatches and go again."